We pick up where the last issue leaves, John, Killawog and Tomar Tu are attempting to break the mysterious barrier that has encapsulated them in. Guy Gardner turns up and makes matters worse by opening fire on the barrier, causing his blast to bounce all over the place. 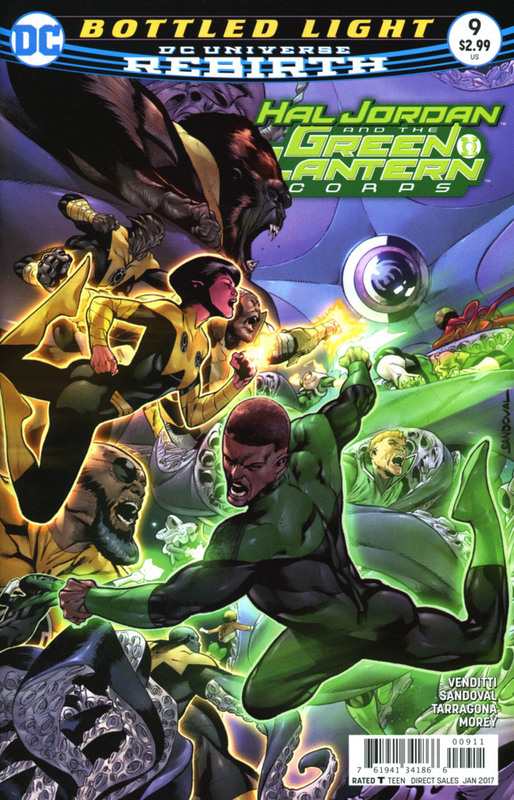 The Lanterns return to the ground, where Soranik is tending to the wounded, when they all discover the Starro infected Xudarian's attempt to attack them. Meanwhile, on the planet Nok, Ganthet and Sayd examine Hal's ring. We find Hal Jordan in the emerald Space, a place where Lanterns end up when they sacrifice their life whilst in the service of the Green Lantern Corps. Hal calls out, only to be answered by someone he met once in his life, that changed it forever... Abin Sur. Back on the planet Xuda, the Xudarian's under the control of Starro spores, start smothering both Green and Yellow Lanterns, when John Stewart figures out how to stop them. He gets Lantern Rot Lop Fan to disrupt the audio frequency, which shuts the spores down. Rot Lop Fan also explains to John that the barrier that has them trapped has similar qualities to that of glass. Bringing to light to the Lanterns that it is Brainiac that has captured them, in one of his bottled cities. Story - 5: This book always delivers. Last issues cliffhanger reveal of Brainiac left you wanting more. Now here we are, and this issue, though devoid of any appearance by Brainiac, it is evident, that the Lanterns are in a world, or rather a bottled city worth of trouble!... Sorry couldn't help myself there. This was a fantastic issue, and a great follow up from the last. Kyle Rayner has just returned... Damn! This series has been awesome so far, and it doesn't seem to be slowing down any. I implore you, if you aren't picking this book up already, please give it a look. It is a must for any Green Lantern fan, even a casual one. Art - 5: The art this issue was solid. Rafa Sandoval is a great young talent. He provides a fresh look to all these characters. His style reminds me of Ivan Reis with a mix of Steve McNiven. I would have really loved to see his take on Brainiac. It seems that Ethan Van Sciver will bring us our next look at him, as he shares the art duties on this book with Rafa Sandoval. There is a fluidity between their styles, so it's not too jarring when they alternate. The opening splash to the reveal of Abin Sur, the art is sharp as it could be. Great work Rafa, look forward to your next issue! Tomeu Morey takes on the colors, and this issue, just like the art, they fit the style and tone of the rotating art teams! The book looks sharp and vibrant, job well done. Cover Art - 5: The cover by Sandoval is great. Really in the thick of the action. Love it.The Kevin Nowlan variant is actually quite neat, but the main cover for me looks a little better.